I'm excited to bring you a video tutorial on a fancy fringe technique that includes braiding, interlacements, and beading. I've worked the technique on the handwoven scarf below, but it is not limited to only handwoven items. This method could be used on any fringed item, whether handmade or purchased. First, a little bit about the scarf. This is the Desert Rose Path Scarf presented by Nancy Dunlap in the May/June 2017 issue of Handwoven magazine. The structure of the scarf is a twill; specifically rosepath which is a variation of a point twill threading. In this case, the treadling produces a charming little diamond pattern. In the article, the project instructions called for two colors of 5/2 bamboo yarn with a sett (ends/inch) of 20. What I had on hand was closer to 3/2 (although I'm not really certain because this yarn was given to me and is unlabeled). I used a sett of 10 and I'm pleased with that choice. The finished scarf has just the right drape. Because the sett was changed, the overall number of warp ends had to be adjusted, otherwise the scarf width would be doubled. Typically, this recalculation would not be too difficult. However, because of the complexity of the fringe technique, the number of ends had to be somewhat precise to create the interlacement patterning. Whereas the pattern called for 122 ends for a width in the reed of 6 1/5 inches, I used 82 ends for a width in the reed of 8 inches. I still ended up with 20 groups of braids, but instead of 6 ends in a group which braids easily (2-2-2), I had 4 ends. This still works but uses 1-2-1 ends to make a three strand braid. This will make more sense in the video tutorial. In addition to adding beads to the fringe, there is beadwork woven into each border of the scarf. The beads are threaded onto the weft yarn, then placed into position between appropriate warp threads as those picks are thrown. The beads I am using are 6/0 Glass Seed Beads - Bronze Metallic (coated). On the loom, the weave structure is fairly open. This fabric drew up nicely with finishing, yet still maintained a lovely drape. This was my first time weaving with bamboo. My weaving friends shared that bamboo really develops a lovely hand once it is washed, dried and then pressed with an iron. Agree!! The fabric became silky soft with a subtle sheen. The finished scarf is 6 1/4 inches by 66 1/2 inches plus 6 inches of fringe on each end. The fringe technique is called a Mexican Braided Fringe. 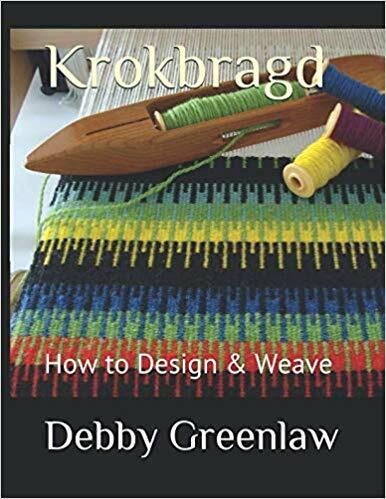 Although Nancy Dunlap provided some written instructions in the Handwoven article, the technique is a bit laborious and more complex than a simple twisted or braided fringe, so I decided to make a video tutorial. I hope you find it helpful! If you have any questions, I'll be happy to respond. And please feel free to share or link to the tutorial if you know of someone who might be interested! I've gleaned some new video skills in the making of this tutorial and I'm willing to continue providing video content if this is something that my readers want. Let me know your thoughts in the comment section below. Finally, as I've previously written, we have six goats pregnant that are due to kid this Spring. Three Mamas delivered on the same day two weeks ago! I thought you might enjoy a few baby pics . . .